The Taken Samsung galaxy s7 edge Case Card Holder is a perfect fit for your Samsung S7 edge! Please notice that Taken galaxy S7 edge Wallet Case is an online exclusive. We have not authorized any other retailers to sell our products. The Samsung S7 edge leather wallet case uses high-end PU leather, while the front cover uses quality epoxy insulation board that promotes stability and durability. It is molded off of a real Galaxy S7 edge in order to make the perfect fit. We have seen the others and decided to break from the trend to design a case that takes the user experience to another level. Our customers can easily and comfortably use their Samsung S7 edge screen, camera, microphones and other ports. 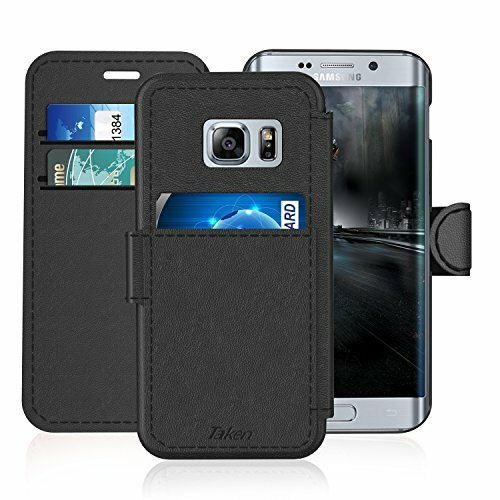 Taken Cell Phone accessories Samsung galaxy S 7 edge folio cases.It belongs to holster / wallets / wallet / flip / shell / cover / covers / purse / purses / bag / bags / handbag / handbags / hard.The special sewing for the edge, compared to glue or ordinary sewing more solid and durable.We are particular about every details of production. And the case is handcrafted from premium-quality leather to ensure durability and show elegance and luxury.